It’s not a surprise to most of us, Instagram is the fastest growing social platform these days. Today, approximately 20% of worldwide Internet users between the ages of 16 and 64 have an Instagram account, according to data from GlobalWebIndex. This is up from 15% in the middle of 2013. 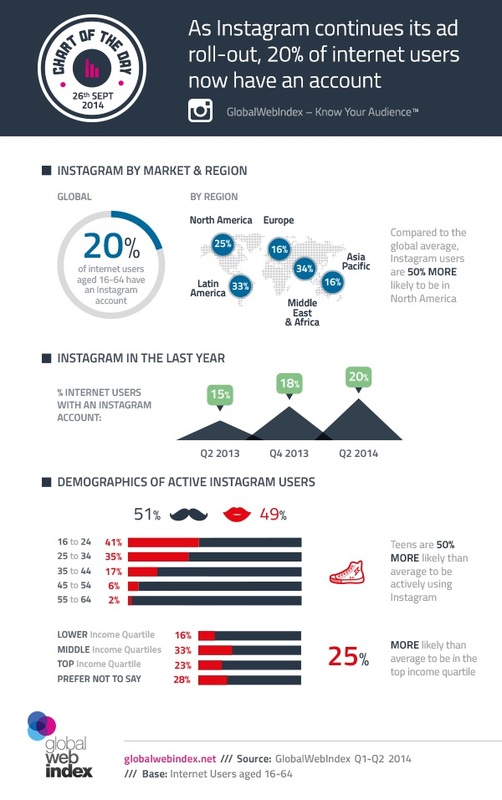 20% of worldwide Internet users between the ages of 16 and 64 have an #Instagram account. Although there are some disparities between continents, Europe and Oceania being slightly behind in terms of adoption, Instagram is growing fast and it is growing everywhere around the world. Teens are 50% more likely to be active #Instagram users than average. These 3 key points will help you understand why Instagram is the upcoming gold mine for advertisers: reaching out to millennials and the top earners across the globe. What is your current strategy for Instagram? Do you think you should invest more onto the platform?